COLUMBIA, MO — Chancellor Alexander N. Cartwright announced today that the University of Missouri has been designated a Purple Heart University in recognition of the university’s support of military members, including veterans and their families. The honor was designated by the Military Order of the Purple Heart, which recognizes universities that support U.S. military men and women wounded or killed while serving to protect their fellow Americans. Nearly 900 MU students are either veterans, active duty personnel, National Guard members, Reservists, ROTC cadets or family members receiving GI Bill benefits. Since 2007, those individuals and faculty and staff with military affiliation have been served by the MU Veterans Center, a one-stop resource center that was one of only three such centers in the nation when it was launched. 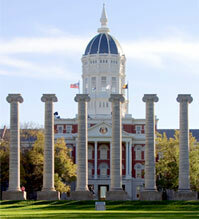 MU has been recognized previously for helping military students succeed in the classroom and after graduation. Publisher Victory Media has repeatedly named MU a Military Friendly School for the exceptional academic experience delivered to military personnel and their families — on campus and off. In addition, last fall MU launched a new Mizzou ROTC Scholarship that will expand higher education access and affordability at MU. The scholarship covers room and board costs for the freshman year for incoming ROTC students who are national scholarship winners from the Army, Air Force, Navy or Marines.